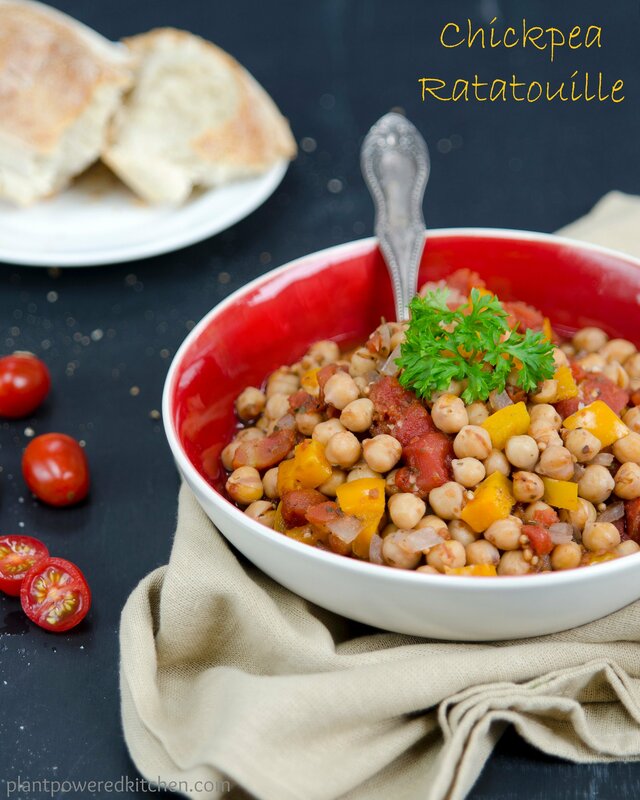 This dish is much like ratatouille in appearance, but using chickpeas and an original spice combination. The flavors are complex and the preparation minimal! 1Preheat oven to 400°F (204°C). 2In a large, deep casserole dish, combine all ingredients except bay leaves. Stir through until well combined, then embed bay leaves in the mixture. 3Cover and bake for 30 minutes. 4Stir through, cover, and bake for another 35-45 minutes, until onions are tender and translucent (stir through once more during baking). 5Remove bay leaves and serve over quinoa or brown rice. Use regular diced tomatoes, or Italian flavored or fire-roasted for a twist. Try making burritos with leftovers. Spoon the mixture onto whole-grain tortillas, roll up and place in a baking dish, then bake until golden. This makes a large batch, but portions can be refrigerated or frozen.